We are pleased to present DASNY's 2014 Annual Report. 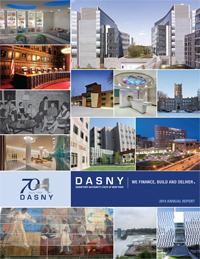 This year’s report focuses on our 70 year history and includes an educational timeline that tells DASNY’s story. Take a look at this important document. Empire State Development’s Bridge To Success Loan Program for contractors will invest at least $20 million to expand access to short-term bridge loans for Minority and Women-owned Business Enterprises (MWBEs). 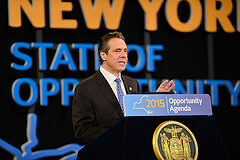 The program will provide qualified MWBEs with the short-term resources necessary to participate in up to $1 billion in contracting opportunities with New York State. DASNY Ranked Third In The Nation! In January, the Bond Buyer announced that DASNY was the third largest bond issuer by dollar volume in the nation for calendar year 2014, with over $4 billion of bonds issued. This ranking reflects DASNY's role in working with the State Division of Budget in the public finance arena, as well as our not-for-profit borrowers. Of the approximately $4.2 billion in bonds issued, over 85 percent of the volume reflects bonds issued for new money and refundings for State programs and projects managed by DASNY and other State entities. The holiday season was a slow time for some, but not for the cross-section of DASNY's staff responsible for bond financings. From the beginning of December, straight through the holidays and into the new year, our colleagues were busy finalizing offering statements, and pricing and closing bond deals. In the fourth quarter of calendar year 2014, DASNY issued $1.9 billion of bonds in nine bond issues. $1.6 billion of this amount was issued in two financings to provide new money and refundings for State programs and projects. The remaining $300 million represents deals for seven private client and school district financings. This momentum has continued into the first quarter of 2015 with $1.3 billion of bonds delivered in five bond issues including four private client financings and one State-supported debt transaction. Our pipeline for the first quarter is strong and includes several of our frequent private client borrowers. In December 2014, CUNY’s Medgar Evers College held a ceremony to commemorate the re-opening of the Charles Evans Inniss Memorial Library. DASNY is proud to have facilitated the $22 million expansion project. 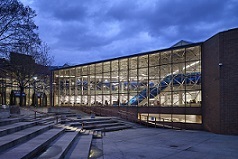 The project, which was delivered in time for student use at the beginning of the Fall 2014 semester, included the upgrade and expansion of the existing library and the addition of a new Welcome Center. With DASNY’s management, the mechanical, electrical, plumbing, fire safety protection and security systems were all upgraded with integrated building controls. The new library not only provides students with valuable print and electronic resources, it also provides the Brooklyn residents who live near and/or work at the college with a state-of-the-art environment equipped with the latest technology in which to learn. For decades, DASNY has worked with CUNY to expand and grow Medgar Evers College. 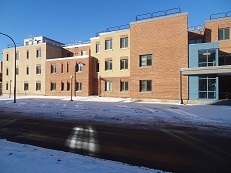 Our diverse work at the college has ranged from complex renovations and expansions of academic buildings to 13pxer mechanical, electrical, heating and cooling system upgrades. We have replaced roofs, security and fire systems, helped develop a new campus master keying system, created a Caribbean Cultural Center and used our knowledge to integrate energy efficiency into much of our work. 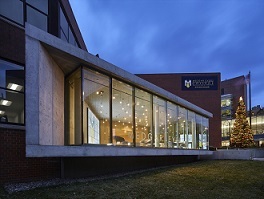 Medgar Evers College, within the CUNY system, is one of four set-aside campuses which authorizes DASNY to direct procurement opportunities to 13px, minority- and women-owned businesses, (the other three set-aside colleges include: York College and Bronx and Hostos Community Colleges). Today, we continue to work with the college to promote inclusion as evidenced by the 65 percent MWBE utilization rate for the Charles Evans Inniss Memorial Library expansion project. 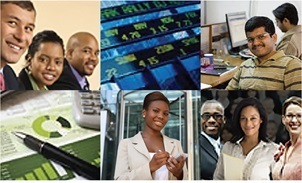 For more information on DASNY’s MWBE Programs, follow this link to our website, http://www.dasny.org/MWSBEs.aspx. To learn more about DASNY’s construction expertise, check out our Construction landing page, and DASNY’s Capabilities section of DASNY.org. At DASNY, we finance, build and deliver. What can we do for you? What do “Sally Ports” and “Wicket Doors"